Long relegated to the position of a utilitarian space, many bathrooms are being updated and remodeled to make them inviting and relaxing spaces. ProSource® of Fort Worth has expert designers to help scope your bathroom project and select the products which ensure the design goals are attained. 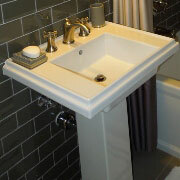 The bathroom sink is one of the key features of any bathroom. A quick visit to our showroom can introduce you to the many options. Available in a range of styles, finishes, and materials, you’ll find a sink that fits any bathroom decor. The best bathroom sinks combine form and function to create a brilliant piece of practical art. Options abound with finishes like brushed, matte or brightly polished metal—along with various sizes and styles. 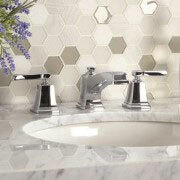 ProSource has the perfect faucet for your bathroom remodeling project. Beyond a place to cleanse, the shower serves as a retreat from the rest of the world. A shower project can be about developing an escape plan, as in creating a space to escape life’s worries. At ProSource, you can view shower doors, handles, heads, and other accessories that can create a spa-like experience at a wholesale price. 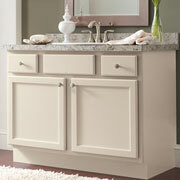 Just because a bathroom needs storage doesn’t mean it should settle for a bland cabinet. A vanity is a beautiful way to add functional storage to any bathroom while also adding to the overall aesthetic of the space. The tub can visually dominate any bathroom space or seamlessly blend into it. Soak in today’s options that vary in size, color and style. 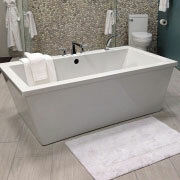 Whatever your design taste or functional need, find the perfect tub for your bathroom remodel project at ProSource. The toilet is easily one of the most used fixtures in a bathroom. As such, it should not be forgotten during any remodel project. 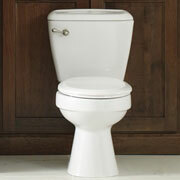 Our showroom is flush full of options, including eco-friendly toilets that save water and money. Work with our bathroom designers to find the perfect model. We serves Fort Worth, Weatherford, North Richland Hills, Keller, and Hurst-Euless-Bedford (HEB), Texas. The ProSource of Fort Worth showroom is conveniently located in Fort Worth, Texas and serves all of the neighboring cities including Aledo, Alvarado, Arlington, Azle, Bedford, Bluff Dale, Boyd, Bridgeport, Burleson, Cleburne, Cresson, Crowley, Decatur, Dennis, Denton, Euless, Flower Mound, Fort Worth, Gainesville, Godley, Granbury, Grandview, Grapevine, Haltom City, Haslet, Hurst, Joshua, Justin, Keene, Keller, Kennedale, Lewisville, Lillian, Lingleville, Lipan, Mansfield, Millsap, Mineral Wells, Morgan Mill, Myra, Naval Air Station JRB, Newark, North Richland Hills, Paluxy, Paradise, Peaster, Perrin, Poolville, Rainbow, Rhome, Rio Vista, Santo, Slidell, Springtown, Stephenville, Tolar, Venus, Weatherford and Whitt.